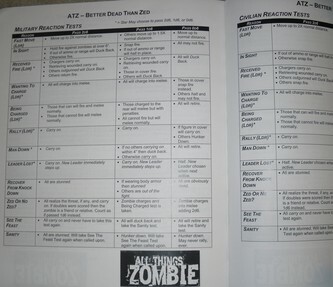 At first glance the All Things Zombie (ATZ): Better Dead Than Zed rulebook looks like it would be a fantastic platform for zombie wargaming gaming, and the original ATZ is a 2006 Origins Award winning product. All Things Zombie comes highly recommended on various forums around the Internet too, which is why I was interested in it to begin with. The cover art is eerie, and it really looks quite impressive as far as covers go. This will sound so cliche, but you really can't judge a book by it's cover though, and that is so true when it comes to this one. When I opened up the book, what I found inside was quite uninspiring, and straight up lacking in presentation. 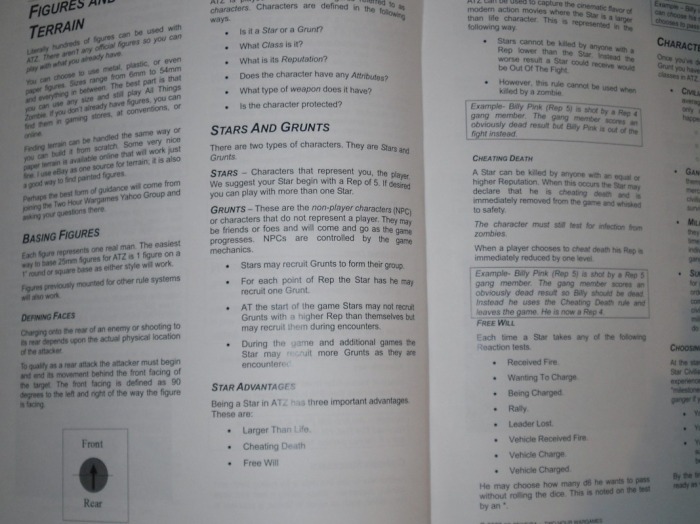 It's like reading a textbook, more than a rulebook for a game system. I guess maybe I've been spoiled by the higher production values of other companies' rulebooks as of late. I'm not unrealistic either. I'm not expecting something as nice as the $45 Flames of War 2nd Ed, or $50+ Warhammer 40k 5th Ed rulebooks for $25 either, but there's definitely room for improvement in this one. In this book, the pictures are purely cosmetic, and under each picture is the wording “Courtesy of Mega Minis”. 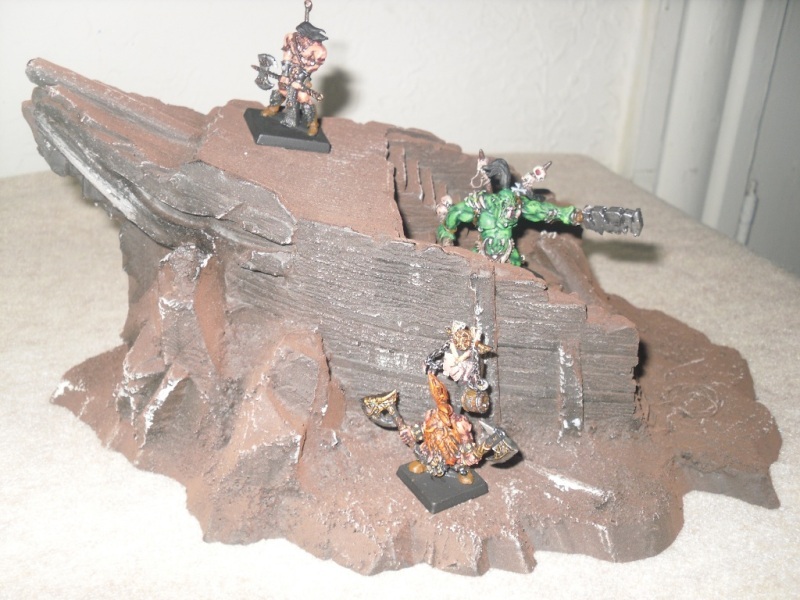 It's clear that the only purpose the photos serve is an advert for Mega Minis, and the sad part is that these aren't even nice photos, or dramatic in-action photos of the game being played. Almost every photo seams to be a handful of random minis standing against a brick-wall background. There's not a single illustration in this book either, aside from one defining the front/rear arc, but they sure know how to make a chart. I'm not complaining about the lack of pictures either, I'm complaining that they wasted space with pictures for purely cosmetic reasons, and in the process the rulebook lacks diagrams and examples visually of the game in-play throughout. Stick figure drawings would have been better, than all of these pointless photos. Things just don't flow smoothly either. It's almost like you need to read the book over about 5 times cover to cover, before fully grasping what's all there. This makes ATZ is a little overwhelming at first, because just when you think you have an idea of how to play the game, along come the next few pages worth of more charts to decipher. So I'll try and explain it as best I can. ATZ uses what they call a Reaction System, instead of the traditional You Go, then I Go. As you go, I can react to your actions, and vice versa. Characters are essentially two types, Grunts and Stars. Stars are your characters played by actual people, and the Grunts are NPCs essentially. A Reputation value plays a role too, it's represented by a number from 1-6, with 6 being the highest. It's suggested that most players are to start off using a Reputation of 5 Star character. The Reputation value signifies training, morale, motivation, experience and fighting ability all wrapped up into a single value. Stars have three special rules too, Cheating death, Larger than Life and Free Will. Stars can't be killed by anyone with a lower Rep value, unless it's a zombie, this is the Larger than Life rule. Cheating Death is simply declared when someone with an equal or higher Rep kills you, and you cheat death, but now your Rep value is one increment lower every time you elect to “Cheat Death”. Lastly Free Will allows a Star to automatically pass some specific tests, without rolling the dice. There are also 4 classes you can elect to be, which are Civilians, Gangers, Military and Survivors. Although as you go, you can also eventually end up being a a Survivor or Ganger. Each class has its own chart to refer too when taking Reaction tests. Upon looking at them, there isn't any huge advantage or disadvantage to which class you choose, as most of the listings on the charts are the same across the board, with some slight variation between them all depending on which Reaction Test you're taking. There's also an Attributes system, which they say is completely optional, and this would add 2 skills to your Star character, and one per Grunt. Creating the rest of your group is like rolling up an RPG character, and I've never been a fan of this at all in wargames. All I want to do is play and refer to a card, or the rulebook for what I need to roll if I hit, what I need to roll to damage something, and what ever else I can do that requires my input. 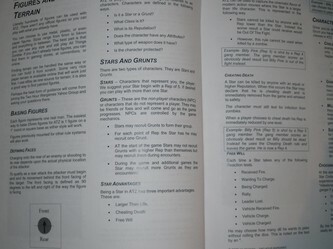 In addition, there's eight pages of nothing but charts in the back of the book to refer too, in addition to the character sheet you'll create just to play the game. This is not counting all of the charts throughout the book, which aren't repeated in the back for easier reference either. Surprisingly there are some really neat things about the game, it's not a total loss. Since this is a skirmish game with A LOT of RPG mechanics, it offers more depth and immerses the player into the setting more than the average skirmish/wargame does. For instance, there are events you roll for every time you enter a new area in the Campaign setting. You can run into Looters, a News Media Crew, Religious Cultists, Escaped Prisoners, Refugees, Medical Staff, Lost Children, just to name a few. This I thought was cool. There's also day, night, evening and pre-dawn settings to choose from, all of which have an impact on the gameplay. Once you've figured out the rulebook, you then find that the basics aren't too complicated either. Movement on average is 8-inches, to conduct melee it's being within 4-inch range, and everything in the game is resolved with D6 dice. With 8-inch movement, and the means to move even further via a Reacton Test allows you to cover a little more ground, a little faster than in most other games. Shooting isn't terribly difficult either. Shooting for example is resolved by rolling a number of D6 equal to the Target Rating of the Weapon (1-4D6, and the shotgun for example rolls 6, but you only keep the 3 highest results) and adding the Reputation value of the shooter. You then compare the result to the chart provided, and essentially a result of 10+ hits no matter what, and 3-7 is a miss, and 8 and 9 results have a unique set of criteria to be met to be a hit or not. The Impact value of the weapon is then used to calculate damage, and this is 1D6 result compared to the Impact Value of the weapon. Less than Impact value, but not a 1 results in the target being Out of the Fight, a 1 is Obviously Dead, and Higher than Impact rating results in being Knocked Down. 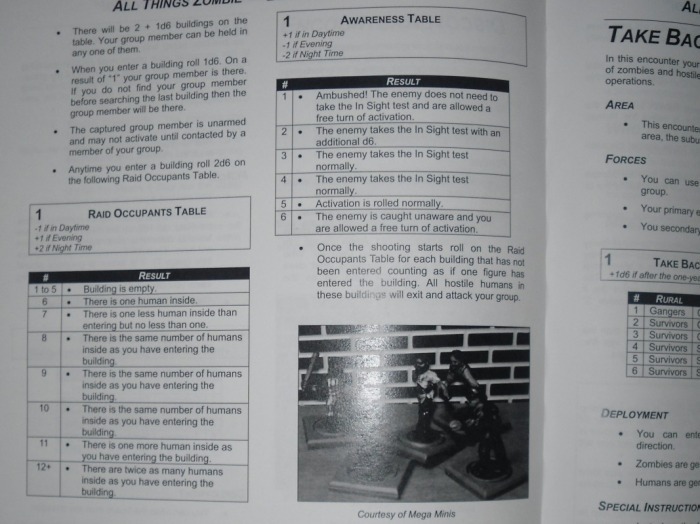 Oh once you learn all this stuff, there's a whole other section worth of rules to control and play the zombies too. 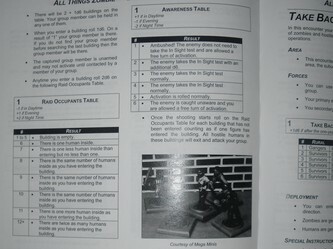 While many of the rules are the same, there are a variety of new rules required to grasp to control the zombies with. The game itself can be played solo, cooperatively, or with even more than 2 players, but it's clear it was designed with 2 players in mind. It's also crystal clear that this is more of a game for someone who's used to doing a lot of micro-managing, and who grasps the concept of dealing with controlling NPCs like a dungeon master, in addition to playing their characters at the same time. One thing going for it though is the fact that this game isn't scale specific . 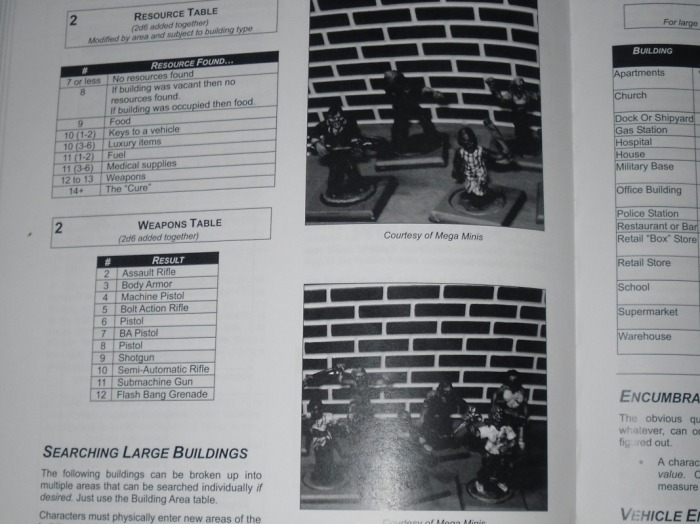 You can use figures as small as 6mm and 15mm, or as large as 54mm scale miniatures to play ATZ with. This does make it a bit more accessible than most, and zombies do come in all shapes and sizes these days, so finding some to play ATZ with shouldn't be too hard, since scale isn't something you need to consider when playing it. I think ATZ relies too much on referring to charts, and rolling dice to determine things that are to happen, and not enough moving, shooting at and running from zombies for my taste. I expected more of a fast paced, easy to learn skirmish wargame, and this really seams more like an in-depth RPG with a combat system, featuring the day 1 outbreak setting of a zombies plague than it is anything else. I guess that's the thing too, because ATZ can be played solo, or cooperatively... it's up to YOU the player to setup all of the possibilities, of how many zombies appear, is that building occupied or not, are there zombies in it, do we find keys to a vehicle, medical supplies or food over there, and did that gunfire attract more zombies, or not? You are somewhat left to be the traditional dungeon master, and player of your characters both. Personally, I like to just play. This isn't my kind of skirmish game. Although I have no doubt that others will find it to be a true gem, based on the very reasons I don't like it. I can't honestly say this is a terrible, or bad game either, because quite frankly, I'm impressed by the scope, and I admire the time that Two Hour Wargames has taken to add so much depth to this game. There's no denying that ATZ is a complex and rewarding game, but it's just not for everyone. My biggest issue is that the rulebook in presentation does a terrible job of teaching players how to play this game too. Some players look for this kind of game, enjoy this level of complexity, and will feel that it excels for its' traditional RPG-like qualities. As for me, I'm still looking for that one miniature skirmish wargame of humans versus zombies, which is fast paced, easy to learn, and most importantly of all, is fun for me to play. 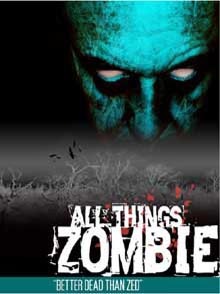 All Things Zombie: Better Dead than Zed might be that game for some, but for me this isn't it. 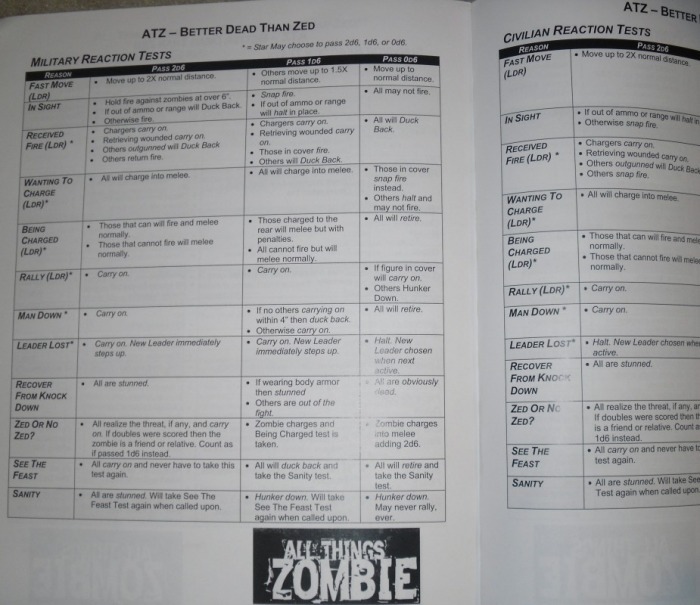 All Things Zombie: Better Dead than Zed costs only $25 for the printed softcover rulebook, or $20 to download the .pdf version, so it won't break the bank to give it a whirl. There's definitely a following for ATZ too, because there are two other ATZ products available from Two Hour Wargames and one free download. 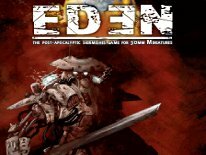 The Haven Scenario book costs $20 for the hardcopy and $17 in .pdf format, the Giving up the Goats scenario is a $3 .pdf only product, and a scenario called The Nazi Zombies Went Down to Georgia is a free download .pdf direct from their website.